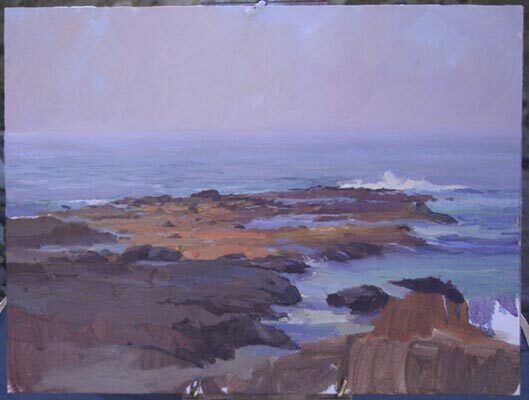 This painting was completed in July during the Sixth Annual Laguna Plein Air event in Laguna Beach, CA. I used a digital camera on-location to capture the painting during its various stages. I have various starts to my paintings. Depending upon the intricacy of the scene I may start with a more refined sketch or in this case I started with a loose oil paint/mineral spirits wash to define the masses. This beginning stage sets the pace as to the view point of the scene, the light and shadow masses and the positive and negative areas of the scene. The artist also needs to develop the focal point very soon or at least know where this will happen in the composition. This second stage is very important; I have to develop the areas that are in shadow in relation to the areas that are in light. This area will be the secondary focal area of the painting. I already know where the main focal point will be, I just do not have time at this point to put it in. 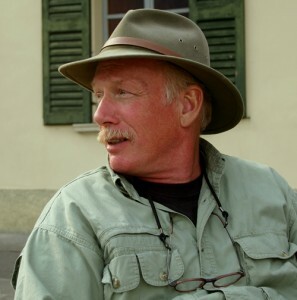 The plein air painter has to concern him or herself with the constant moving light. What is in shadow now may in ten minutes or less become filled with light so the artist needs to develop the painting with this in mind. Here I start to place paint in a more opaque fashion over the initial wash areas of light and shadow to establish the correct value and color temperature. The water area surrounding the rocks, are also given attention. From the very beginning one of the things that caught my interest in this scene was the occasional wave action against the far rocks. 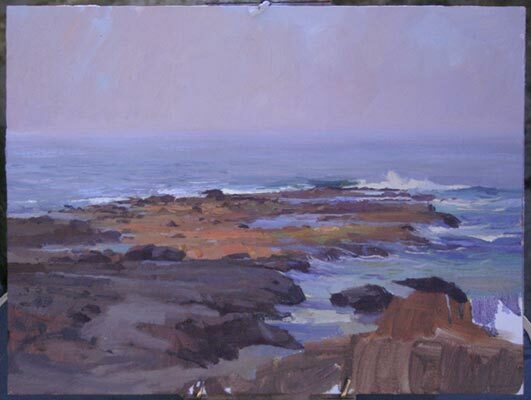 This will be my main focal point, so in this stage I observe the waves for awhile to determine at what stage of the wave hitting the rocks, I want to portray. This is placed in along with developing the foundation of the ocean with the horizon line and placing in some of the sky value and color. This is a refinement stage; my eyes continually scan the scene to see the harmony in the scene and to be sure of retaining that harmony in the painting. The sky is developed further with not value changes but subtle color temperature changes. 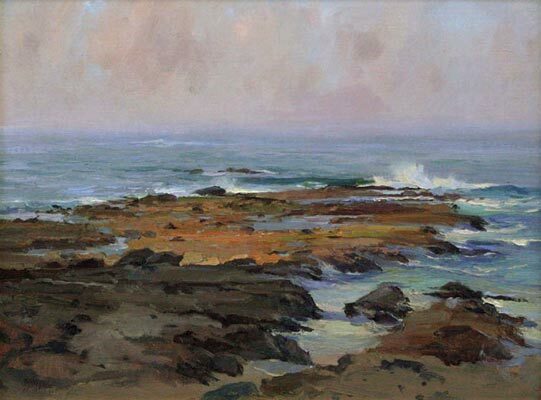 More delicate attention to the subtle ocean colors with the suggestion of movement of waves. I also make understated additions to the rock area. Observing my tide chart I notice that the tide is going out so I will be aware of more rocks that will start to be exposed, this may be helpful in the finished composition. 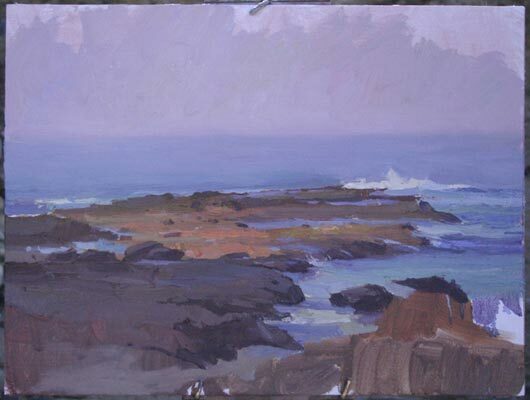 This stage I continue to develop the subtleties of the ocean with additional light and dark values placed in certain areas to give the suggestion of waves and waves breaking on the rocks. 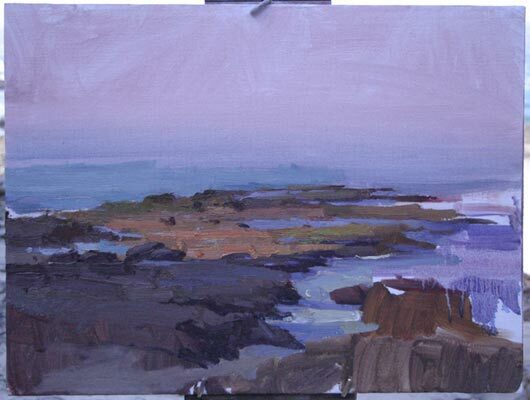 I start to develop the shadowed foreground area in the lower left hand corner. Here I give final attention to edges, softening some like the wave splash, giving the suggestion of wind and spray of the water. 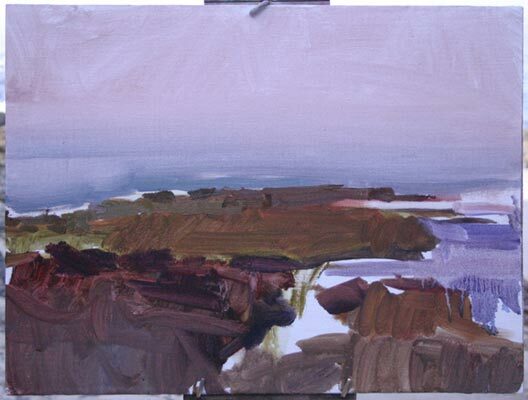 I review other areas to determine the edge quality and contrast of value, especial at the focal point. I develop more definition of rocks further out in the ocean as that tide recedes and a few indications of waves further out. The shadow area of the foreground is finished in the lower right hand corner. The very last stage is getting away from the painting for a while and looking at it with a fresh eye the next morning. 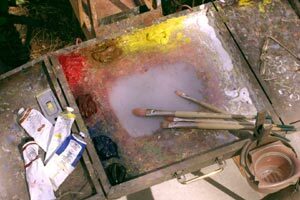 Observing the painting in the studio away from the source allows me to see the painting for what it is. At this point I should have all the visceral response from the scene I need. Any refinements now are more design decisions, either simplifying or stating more boldly various areas of the painting. Sign it! and you’re off to start another. Wow that’s amazing! Thanks for the helpful tips, and I especially love seeing what each phase looks like on it’s own. It helps to know what I should be aiming for each time. It’s very interesting and helpful to learn something rare. Best wishes. Thanks. Wonderful demo and a nice painting. Thanks for sharing! I’m glad that i found this archive post! Really nice demonstration!